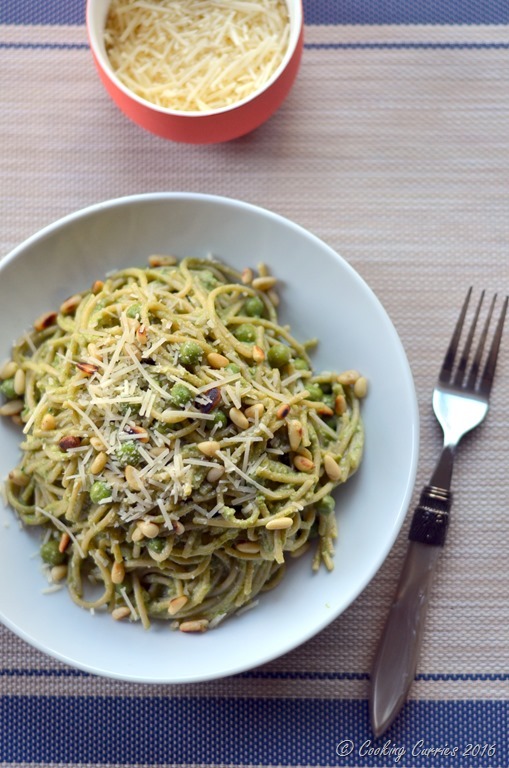 This spring spaghetti with spinach pea pesto screams spring with its vibrant green color and the spinach pea pesto is a wonderful alternative to your regular pesto! Plus, its gluten free too! Looks like we have made it to the better part of the year, spring!! Its pouring here and still a little cold here in Seattle, as I am typing this down but we have started getting our share of the sunny and warm-ish days here and there! So, yay! The little guy is learning about seasons now and knows to name them and also know a few things about them, like there are flowers in spring, its sunny in summer, leaves fall in fall and there is snow in winter. But he has not quite grasped it all yet, I mean, he is just 3 years old, so on a sunny day, he asks me – Amma, is it summer today? So, the other day when I saw spring blossoms outside, I pointed it out to him and told him that spring is here. He got so excited and was randomly screaming – Its spring today!! – throughout the day. Although, he did ask me that, if it was spring today, is it going to be summer tomorrow? Well, from his perspective, it seems like a valid question. Yeah, we are going through that phase of a lot of questions being asked and us, trying to explain it to him in a way he understands. It is fun! Well, so far at least, because we have been able to answer his questions somewhat to his satisfaction. I have taken this opportunity of him learning about seasons to explain to him about various food that is there during each season. So, I made this Spring Spaghetti for dinner one of these days and told him it that we were having Spring Spaghetti that night. And he asked, like the season? I said, Yes, just like the season. 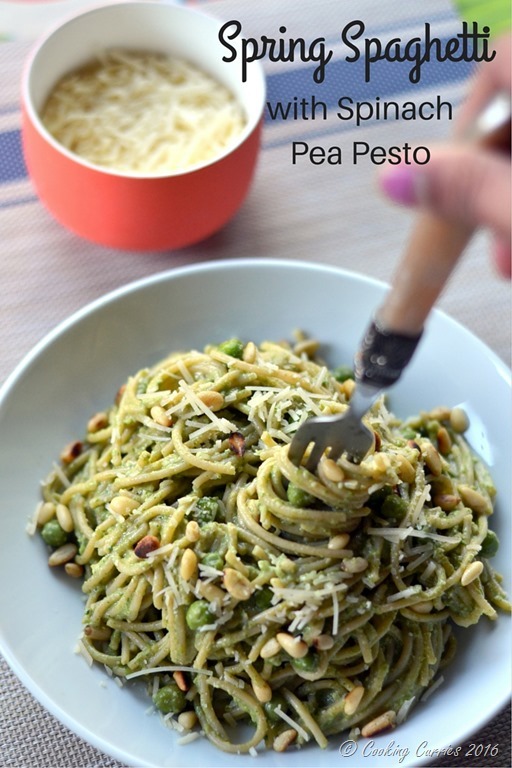 And just like each season has a different special thing to it, there are also special vegetables for each season and we are eating this spaghetti with green peas in it because it is a special vegetable for spring! I don’t quite know if he understood that, but I explained to him anyway. I think its good for the kids to have something to relate to the food they are eating, some story, especially if it is also about something else they are learning. Those little minds are trying to put several things together at this age and it helps to give them a little bit of brain food, now and then. 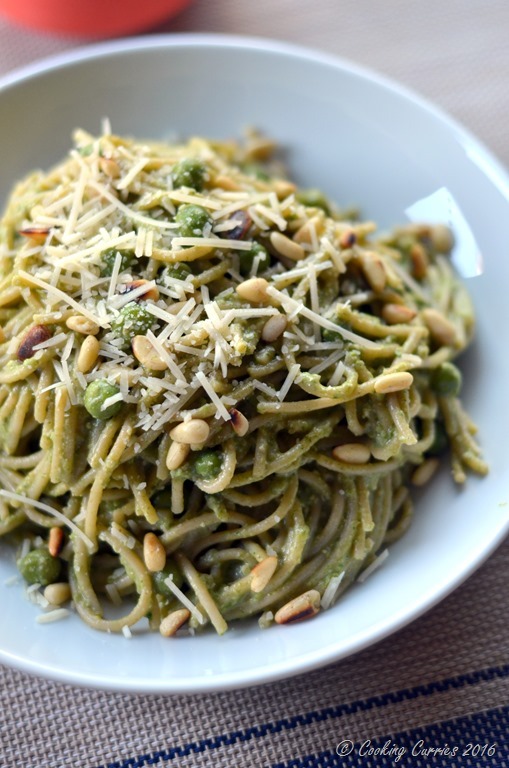 This Spring Spaghetti with Spinach Pea Pesto is one of the easiest things to make and if you are like me who dislikes pesto in general, because of the basil-walnut combo, you will love this, because it’s got a nice sweetness to it from the green peas and really smells so fresh like spring! Cook the spinach and the green peas in boiling water for 3-4 mins, drain and keep aside. 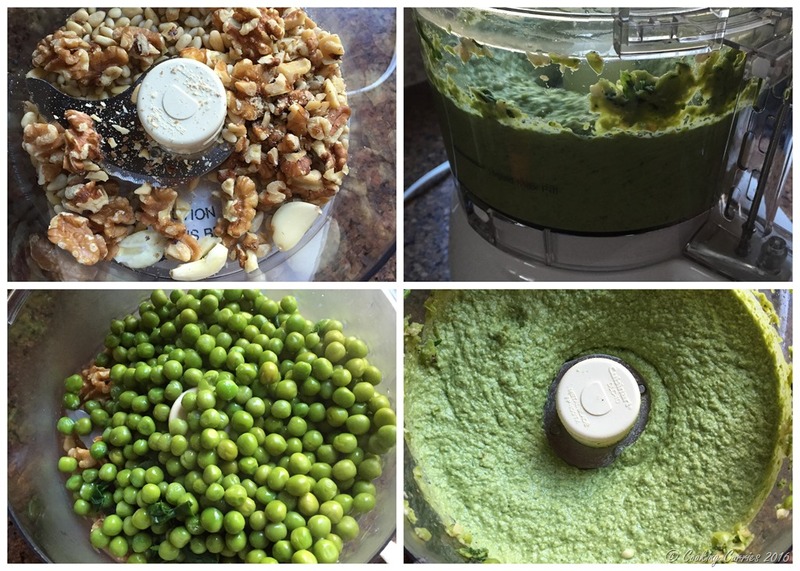 Keep aside about 1/2 cup of the cooked spinach – green peas. Puree the rest of the spinach-green peas with all the other ingredients for the pesto, except the olive oil. Once they have come together a little, add the olive oil with the food processor running. Meanwhile, cook the pasta in salted water, drain and keep aside. Add the pesto to the hot drained pasta, mix well and serve with parmesan sprinkled on top. Here are some other of my favorite spring recipes that you might be interested in! Disclaimer: Cooking Curries is a participant in the Amazon Services LLC Associates Program, an affiliate advertising program designed to provide a means for sites to earn advertising fees by advertising and linking to Amazon.com. That sounds delicious with the courgette pasta!! And thank you! ? the ingredients look like they would go well together and the picture has my mouth watering. I am a foodie, and reading this and seeing all the pictures makes me just want to cook this! Yummy! Thanks Enni maria! Do let me know how you like it! This looks soooo good! 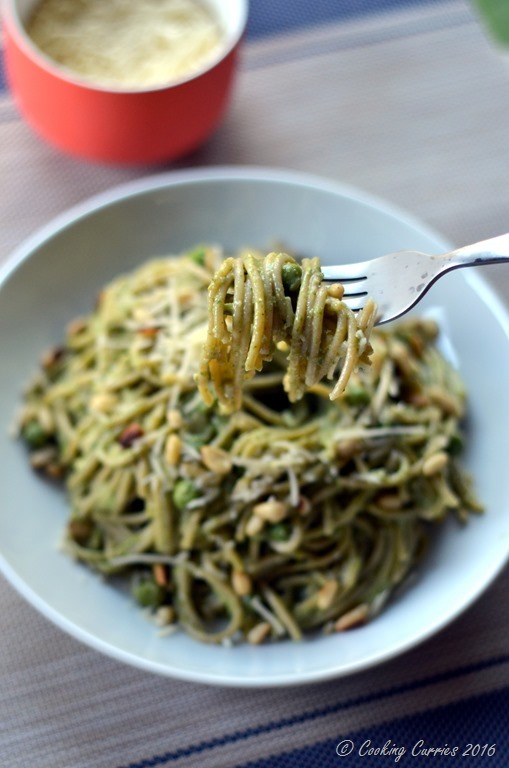 And it doesnt look dredged in oli which is common for pesto dishes, will definitely try this! Yes, I don’t like it a whole lot oily like that, so I used just enough to blend it all in! Sounds super healthy! Maybe I can try this one out. this looks good will have to try it and see if i can get my band mates to eat their greens for once! This sounds lovely and what a brilliant idea to tie it in with your son learning about the seasons. I love the idea of special Spring Spaghetti and will be borrowing this idea! Thanks Tori! Yes, he is learning so much now that I wanted to help him out a little! ? Oooh, I would totally try this. It looks so good and easy to make! Yum! Let me know if you do! ? Yes, please. Pesto pasta has got to be one of my all time favorite dishes. Thanks for getting me ready for dinner.
? thanks Indigo Ocean! And you are welcome! Yum! This looks absolutely delicious! I’ll have to try this out. Thank you or giving me another great recipe to try. You are very welcome, Tammy! ? Oh this is perfect for me because too much basil irritates my stomach and makes me sick so this pesto sounds like it would be more gentle on my stomach! Can’t wait to try the spring spaghetti! I hope you try this! I’m sure you will love it! We tried this one and it was awesome! Thank you very much. Thank you Shawn!! So glad you loved it ? that looks so good, yum! thanks for sharing this recipe, It’ll be one I try out! Shared on twitter because these pictures and this recipe both look too amazing for me to keep all to myself! Thank you very much EG!! YUM!!!! We all love pesto here and we grow our own spinach – this recipe is quickly going to become a weekly favourite!! Wow! Amazing pics that have me feeling hungry now. I bet this pesto is delicious. It’s looks so yummy! You’re making me hungry..lol! I’d love to try this recipe. Thanks for sharing it. This looks and sounds so yummi!! Definitely going to try that one myself! This recipe sounds like it would taste great! I would try it, but I don’t have a device in which to make the puree.